In aboost to the ruling TRS in the March 12 Legislative Council elections in Telangana, two MLAs of the Congress and one TDP MLA announced their decision to join the TRS. TDP MLA from Sattupalle Sandra Venkata Veeraiah Sunday said he had decided to join the TRS in the interest of development of his constituency. "It would be an injustice to people who made me win (the election), if I cannot develop it. That is the only objective. I am not changing party with selfishness or for my personal reasons," Veeraiah said. Veeraiah met Chief Minister K Chandrasekhar Rao on Saturday and urged him to release irrigation water to save crops in his native Khammam district which was accepted. Two Congress MLAs -- Rega KanthaRao (Pinapaka) and Atram Sakku (Asifabad)-- said Saturday night they had decided to join TRS in the interest of development and welfare of STs. They said they would consult legal experts and quit assembly membership and seek fresh mandate if necessary. The strength of the Congress in the 119-member Assembly is 19 and it would come down to 17 with the decision of the two MLAs to join the TRS. The TDP has two MLAs and would be left with only one legislator following Veeraiah's decision to leave the party. The Congress has fielded a candidate in the election (MLAs quota) to be held to fill five vacancies in the council. The TRS has nominated four candidates, leaving one seat to its ally AIMIM. 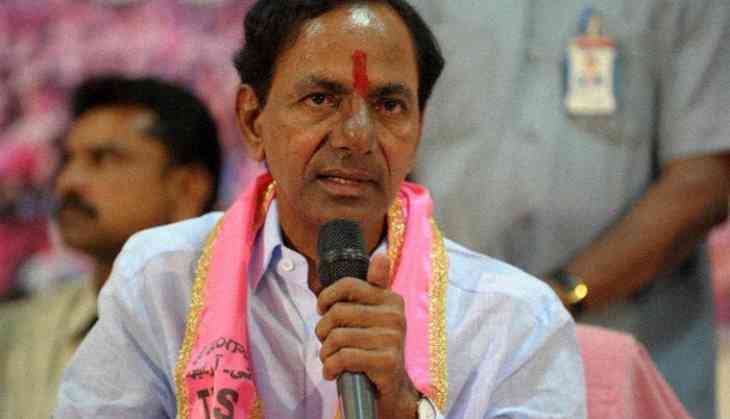 The TRS' strength is 88, with two other MLAs also supporting the party. The Congress was banking on the support of the two TDP MLAs in the MLC election. However, its chances have now been dented with the decision of the two Congress MLAs and the TDP MLA to join the TRS.